I’ve been having a great time this winter participating in a scavenger hunt challenge, creating pages based on a list sent to me by Janet at Monkey Island Madness on Ustream. I have a problem keeping my creativity going and this project seems to solve that problem. There is always another challenge to work on if I want to do some crafting. Today, I thought it would be fun to show what I’ve done so far. I’m using my day planner from 2017, the paper is thin, but I like the spiral binding because I know that the pages will expand and I need to have room to grow. The first challenge, shown above, is pretty self explanatory. I’ve been collecting tea bags so I used them as the background. I added a doily and a teacup from a stamp that I carved, some tea bag tags along the top and it was done. I think this may be my favorite page so far. I am just not cut out to do coloring book pages. I managed to color in these 2 ornaments, but knew that I wouldn’t get the background finished so I cut out some scrapbook paper and glued it down. I used the metallic and glittery samurai pens so it looks much nicer in real life than in a photo. I decided to do a laundry day clothesline for the labels. I think I need a few more, and add a laundry basket to the picture. Well, I already had this hanging doodad given to me from my art friend Joanne so I created a wallpapered wall and doodled a frame around it. Now I feel as though I have a special place to keep it. Challenge # 5 Include something you would normally throw away. I think this was the first challenge I actually did. I created a wastebasket using a plastic wire bag that you get with fresh fruit and tucked a bunch of Christmas trash into the top. I have a Christmas crown from a cracker, chocolate coin wrappers, a scrap of wrapping paper and some clothes tags. Challenge #6 photo of a celebrity you either love or hate. Now tell me the truth, do you think that I love or hate this actor? I got a little bleedthrough on the last photo, so I will probably be replacing that one. The other photos represent some of his iconic roles thru the years. I think he’s held up pretty well, don’t you? Challenge #7 flower or a leaf. A work in progress. First I sprayed the background with bright spray ink, then drew in the flowers. I filled it the background with a black marker, and begin to embellish with a white pen. It’s going to take a while to finish this one. I do love jigsaw puzzles but nowadays I only do them online. I tried to take a photo of one of the completed puzzles and use that, but couldn’t get it to work. So I bought a kids puzzle from the dollar store, put it together and took a photo of it, since it was too big for my journal page. Done! I also added a bunch of completed word search puzzles as the background. I’ve been working on this project since the beginning of January. The deadline for the challenge is March 1st. With 68 items on the list, I probably won’t finish in time. So what? I’m having a lot fun and it gets my creative juices flowing. Summer Waves on the Beach, a mixed media postcard using gelli-plated and decorated deli paper, lace, painted cardstock and a sand dollar stamp. Hot weather has hit us here in Michigan. Some of my friends revel in the heat, I just sit and swelter; gripe and complain. I may just drive over to Saugatuck this weekend, by Lake Michigan to feel the cooler breezes and get away from the hot air. I stopped in to pick up some Chinese takeout yesterday, only to find the restaurant packed with people – a crowd at the door, either waiting for a table or, like me, waiting for their takeout order. I had forgotten that it was Chinese New Year. 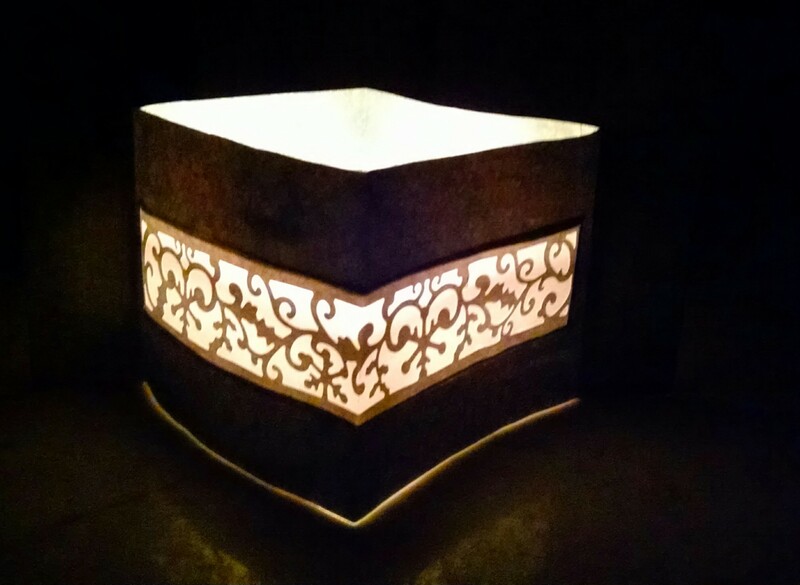 I decided to celebrate in my own way (besides the food) by making a decorative paper lantern in honor of the occasion. First, I picked out some decorative paper from my extensive collection. and cut it down to about 41/2 – 5 inches high and 12 inches long. This was an impromptu craft so I was just estimating the size. 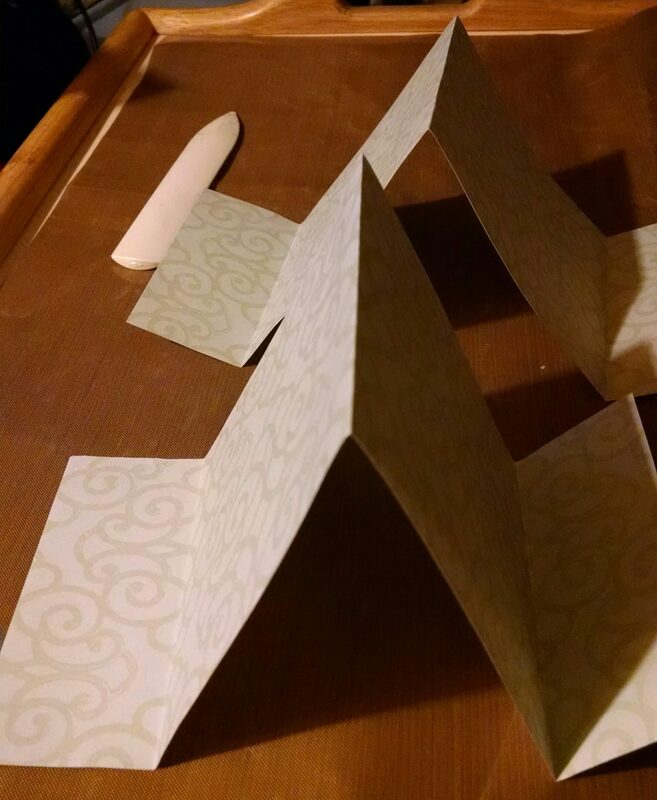 The lantern would be a diamond shape so the paper was folded out in the center “mountain” with 2 “valley folds” at either end. 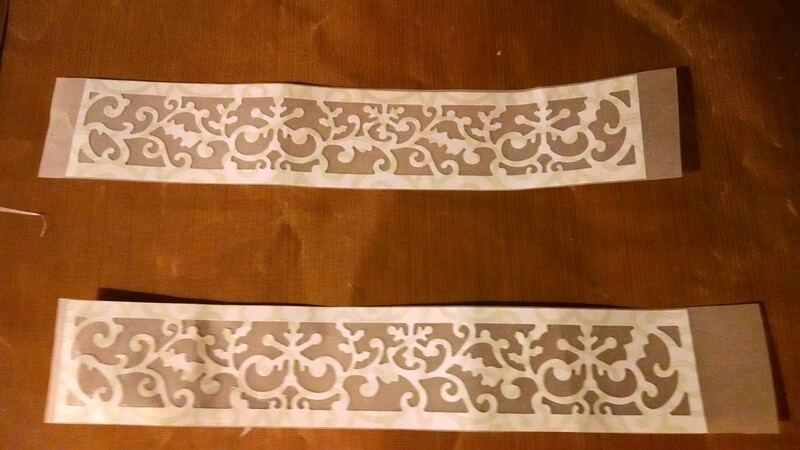 I needed something for the light to shine through, so I die cut 2 filigree strips and backed them with vellum. 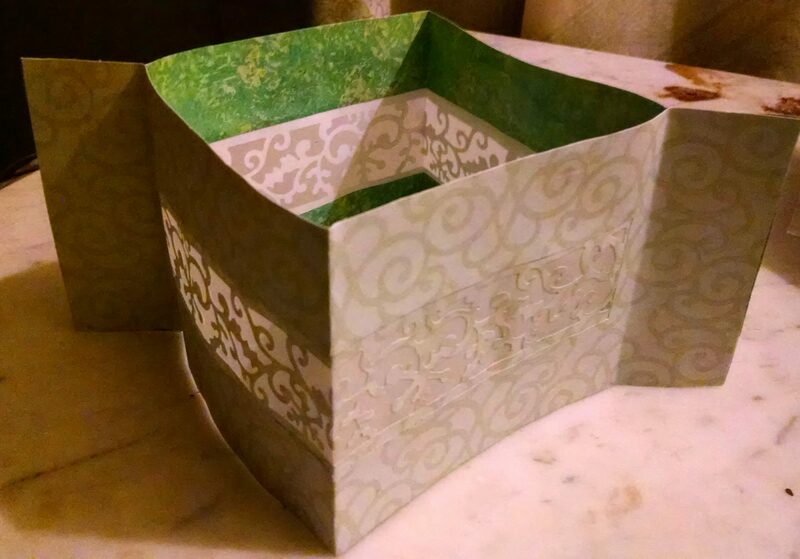 The tricky part was to cut a strip in the center of the outer and inner parts of the lantern and glue the vellum strips . But, after a lot of finagling, I finally got it all together. The vellum strips were safely sandwiched between the outer and inner sections. I glued the two short ends together to create the squared shape so it would stand on its own. I may still add some embellishments to it, as it still seems a little plain, but I like the finished product. I added a flickering light in the middle (sorry, real candles make me a little nervous that close to paper) and sat back to view the effect. With the new year, comes the hope of a better tomorrow. My own personal hope is to find balance and patience for any difficulties that lay ahead. January calendar layouts from some previous years. I’m finally going to show off my favorite altered book page created for the round robin in which I participated. You can see some of the other pages that I made for the different themed books here, here , and here. Rose Ann brought in a cookbook to alter, her theme being Women, Wisdom and Recipes for Friendship. Every now and then, throughout the book were partial pages cut in half circles. As soon as I saw those pages I immediately knew I had to make some sort of a layout using the round shape as a fan. I couldn’t wait to get the book. the left side of the page with the completed “fan”. The left side without the fan. The right side of the page with the “fan” in place. The right side of the page without the fan. I knew that the fan could be flipped back and forth from one side of the page to the other, and that there would be 2 ladies on either side, taking turns at hiding behind the fan. That is as far as it went for about 2 weeks. Then came the flurry of a brainstorm – I would use old Japanese geisha prints and they would flirt from behind the fan. It took a while, but I finally finally found 2 ladies with a similar look (probably by the same artist) and printed them off. They were cut out and glued on to a scrapbook page with a bamboo-like design on it. I really liked that the figures were big enough to go beyond the limitations of the book and off the top of the page. The fans were created with napkins , the slats or spines of the fan made by painting craft sticks and gluing them down. I carved a stamp to look like an Asian signature seal called a chop loosely using my initials (stamped in red). The quote I used was from “The Pillow Book” written by Sei Shonagon, a lady of the Japanese court who lived in the eleventh century. I finished it all off with a small red tassel hanging off the bottom of the fan. So this is how I tend to work, In half-planned sort of way. I have an idea, or at least a semi idea. I can picture in my head how I want it to look but I really don’t have a clue on how to execute the idea and make it happen. From then on I just play around until it all comes together. It always seems to work out in the end.